Learn more about the anthropology degree program at Rollins College. Rollins’ extensive collection of archaeological artifacts—plus a nearby pre-Columbian Native American site—allow you to conduct fieldwork using the methods and skills learned in class. Question the status quo. Examine social norms. Resist injustice. As an anthropology major at Rollins, you’ll learn what it means to be human. Our program helps you understand our past and present as you examine crucial global issues, including immigration, racism, gender discrimination, access to health care, and the environment. A springboard for careers in education, health care, law, medicine, media, public advocacy, marketing, civil service, and business, the study of anthropology is meant to stoke your curiosity about the world and hone your cultural agility— skills that are invaluable in our increasingly global society. You’ll learn practical problem-solving skills, field methods, and communications techniques to help you navigate the world—and a sense of empathy and understanding to help you appreciate it more deeply. Hands-On Learning Our extensive collection of archaeological artifacts—plus a nearby pre-Columbian Native American site—allow you to conduct fieldwork using the methods and skills learned in class. Community Connections You’ll make local-to-global connections in your studies, working closely with community organizations and activist groups as you study culture and human experiences. Faculty Mentorship With a friendly, open-door policy, faculty members embrace collaborations with students and encourage in-depth, interactive learning. Our courses probe the biological basis of human society, societal norms and behavior, social change, and cross-cultural similarities and differences in areas such as kinship, politics, economics, religion, youth culture, globalization, and gender. 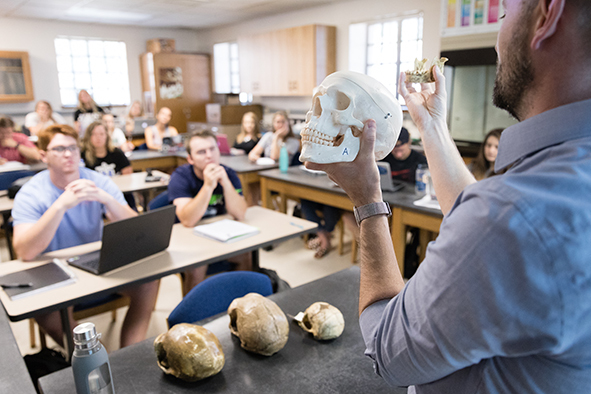 ANT 210 Human Evolution In this introduction to physical anthropology, you’ll review genetics, examine the fossils of human ancestors, and dissect debates among paleoanthropologists to illuminate how science works. ANT 202 Foundations of Latin American and Caribbean Culture and Society In a survey of Latin American and Caribbean history, anthropology, and literature, you’ll study the region's prehistory, colonialism, slavery, music, dance, race and identity, tourism, and globalization. ANT 255 Middle East Culture Explore the everyday lives of people in the Middle East as they negotiate the challenges of globalization, new media, religion, and the legacy of colonialism. ANT 360 Anthropology and the Environment Examine the impacts humans have had on the environment throughout history, focusing on contemporary human-environmental relationships, including our impact on land, climate, water, and major ecosystems. ANT 227 Curating Archaeological Collections Delve into the professional standards, methods, and ethics of curating archaeological collections through extensive hands-on work with artifacts, human remains, and paper records from actual archaeological sites. ANT 305 Activism and Social Change Learn how to use anthropology to take action on pressing social problems. Examine issues related to race, gender, sexual orientation, immigration, and more to consider how anthropologists fight inequality. Student Leaders on Campus In addition to Lambda Alpha National Collegiate Honor Society for Anthropology, our students play leadership roles in many clubs across campus, including EcoRollins, The Democracy Project, Medical Ethics Club, Rollins Improv Players, and Voices for Women. Study Abroad You’ll have the opportunity to apply anthropological skills you’ve learned in the classroom to real-world settings by participating in semester-long programs in countries such as Japan, Ireland, and Brazil as well as short-term field studies in Guatemala, Morocco, and Mexico, and a summer internship in Uganda. Community Engagement We work with numerous community partners, giving our students the chance to engage in important social issues, like farmworkers’ rights, voting rights, undocumented immigrants, LGBTQ youth, and health inequities.